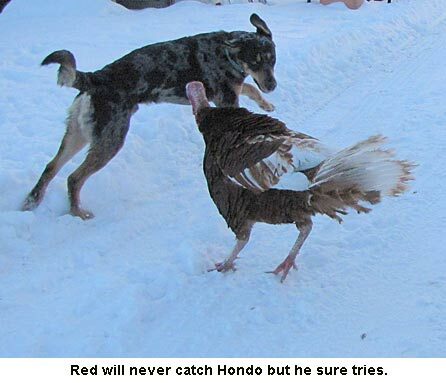 You wanted to see pictures of Red chasing Hondo? Well here are a few. Honestly, those two go at it for fifteen minutes at a time. 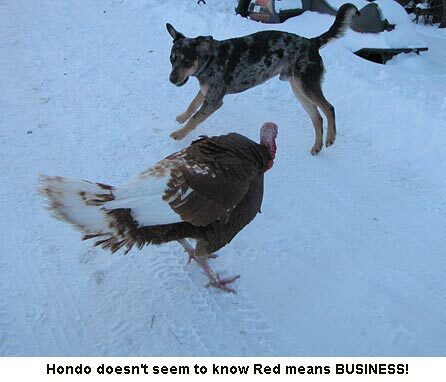 Red, our Bourbon Red tom seems to be in earnest about the whole deal while Hondo thinks it’s great fun. He doesn’t seem to notice Red’s scowling face and determined look at all. Our weather finally turned nice. Today it’s FIFTY degrees with the sun out brightly. Boy, is the snow melting! I’ve been having periods of shortness of breath and chest pains so I went to the doctor today to get that checked out. I spent five hours at the clinic being tested and they are making an appointment for a stress test for me in the near future. So far, nothing has showed up. I hope it’s just Cabin Fever! When I got back from town I sure noticed the snow pack on the driveway getting thawed. I sent up a rooster tail behind the Subaru all the way in. But I never felt like I was getting stuck so I just kept coming the whole mile and a third to the house. Will’s been under the weather this last week, feeling tired and achy. He, too, went to the doctor last week. The Dr. put him on antibiotics with the idea that he (besides me and Spencer!) had a run-in with a deer tick last summer and picked up Lyme disease. He’s four days into the antibiotics and does feel better. When I came home from town he was outside, in a T-shirt, working on a tractor! I’ve got all my peppers and petunias planted and in their little plastic greenhouse next to the woodstove in the living room. Wow, that was a lot of peppers, but this year we have a 32-foot hoop house to put them in. Do not mess around with the chest pains! In January I had them for 4 days (thought it was just indigestion) and ended up having a heart attack. I’m just about the same age you are and never thought this would happen already. Was back in the ER a week ago & ended up having a stress test and an echo yesterday. We’ll see what the cardiologist says. As hard working as you are, be very, very careful with exertion until you find out for sure. Your pictures brought back memories….when I was a kid I had a Palomino buck rabbit I showed in 4-H. He and our dog used to chase each other around the yard. We got miles of laughs out of it. I’ll take some pictures of the peppers (when they pop up) and petunias today, although I don’t know if it’ll show much as they are SO very tiny. Thanks for your prayers. I know they work. Thanks so much for adding me to your prayer list. I really believe in the power of prayer! Sounds like you had a rough time of it. And I’m glad you’re feeling better. My stress test is the chemical one as my bum knee won’t let me treadmill. That’s next Wednesday so we’ll see what gives. No anxiety for me, just want to get fixed up so I can hit the garden soon!!! Love spring. Love the pictures of the “family”. I really enjoy all the animal pictures. Can you take some pictures of the peppers and petunias? I would enjoy seeing them as well. I’m looking forward to spring. I want to see things sprout up and grow. I’m glad your taking care of yourself and getting looked at. I will keep you in my thoughts and prayers. I’m glad your husband Will is getting better. Jackie, lots of ailments can cause symptoms that mimic heart issues. You live a healthy, active life and if anyone can conquer whatever is wrong, it’s YOU! My husband has been a heart patient for 22 years – since age 46 – and he is on the way to go swimming this morning! I am praying for you! Please keep us posted as to how this all goes. Naw. Not by a long shot. Just gotta get over whatever’s wrong. So glad you liked the book! I just recently found out that you must have an Amazon account; i.e. have bought something through them, in order to leave a review. (by the way, the next book in the series Will thinks is even better than Eagles and will be out before too long!) If you do facebook, there’s a facebook page for Summer of the Eagles where you can like it. I do hope your tests come out OK. My husband was having the same problems a few years ago. They scheduled a cardiac cath for him. It seems he had a few arteries blocked. They slipped in a few stints and he was good to go again. Good thing he had the cath. I just finished reading “Summer of Eagles”. It has been such a long time since I have read a good western. Louis LaAmour move over, LOL. Thank you for writing it. Life is such a game for dogs! Hoping that all tests show nothing serious and that you are both well soon! Loved the pics of Hondo and Red. I hope your chest pains aren’t anything serious and that Will gets over whatever crud he has quickly. It’s a pain to have physical ailments get in the way when there’s work to be done! My thorn in the flesh is arthritis in my back and it’s frustrating at times as there’s so much I’d like to be doing. Jackie….maybe its time to slow down a little? We are getting older. 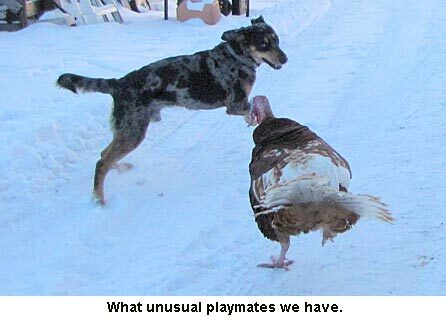 Hey Miss Jackie, the pics of Red and Hondo are fun….Reminds me of a huge old tom we had. He would play with a volley ball or basket ball our teens would roll. He would try to kick it and chase it all over the yard yelping and gobbling. We had lots of laughs till he became a monstrous big dinner. We didn’t desire a turkey dinner for quite a while after we had eaten all those leftovers, soups and meat pies.